Jess from Mark Romine Photography just sent over some beautiful images from an April 3rd wedding that took place in Champaign, Ill. 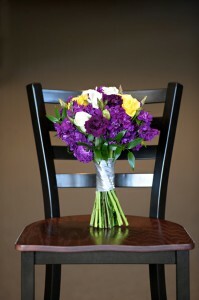 The bride carried a medium handtied boquet of purple stock, dianthus, and lisianthus with white and yellow roses. 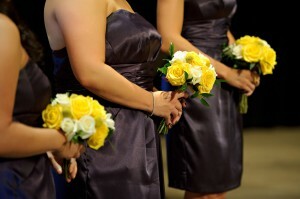 Her bridesmaids carried sunny bouquets of yellow and white roses accented with yellow billy balls (Craspedia) to stand out against thier eggplant dresses. 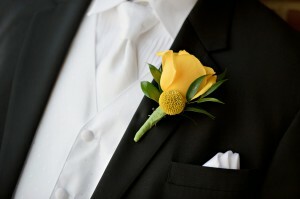 The groom wore a yellow rose boutonniere accented with a billy ball. To coordinate the groomsmen sported roses and the ushers just the billy balls. Thanks to the happy couple for allowing us to be part of their wedding day! For more photos click here. Another thanks to Jess and Mark of Mark Romine Photography!